Set two years after Dawn of the Planet of the Apes, War for The Planet of the Apes sees Caesar and his most loyal friends Maurice, Rocket, and Luca, setting forth on a dangerous quest that pitches them into new terrains, and into the paths of unexpected new friends. 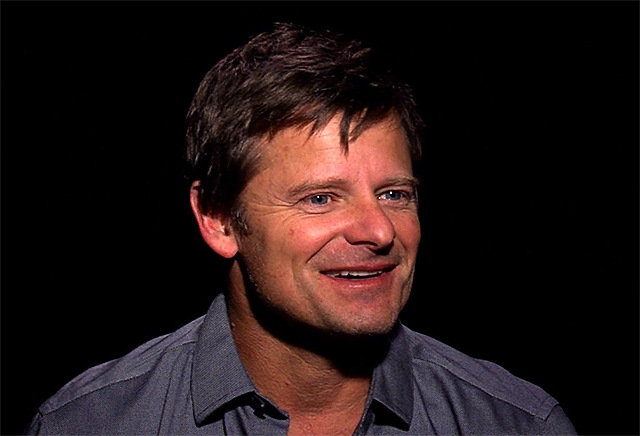 Chief among these is Bad Ape, a talking chimpanzee with an unfortunate name but the warm voice and incorrigible charisma of Steve Zahn. During ComingSoon.net’s visit to the set, the filmmakers were tight-lipped about the affable actor’s role in the Apes franchise’s upcoming installment. But the Fox Showcase last week unveiled the new character in a rousing sequence that boasts a horse chase through a snow-caked forest, and the uncovering of a quiet sanctuary where the former Portland Zoo resident has been holding up all alone and very lonely for “a long time.” Between his big hopeful eyes, ample earnestness and Zahn’s easy charm shining through his motion-capture performance, Bad Ape is sure to be a fan favorite of this thriving film series. After the showcase, ComingSoon.net sat down with Zahn to discuss the key to War for The Planet of the Apes, playing Bad Ape, and what it’s like performing mo-cap alongside the acting discipline’s pioneer, Andy Serkis. Plus, we pitched our idea that in this Western-like branch of the franchise, Bad Ape is the kooky prospector to Caesar’s grim cowboy. 20th Century Fox will release War for the Planet of the Apes in theaters on July 14, 2017.